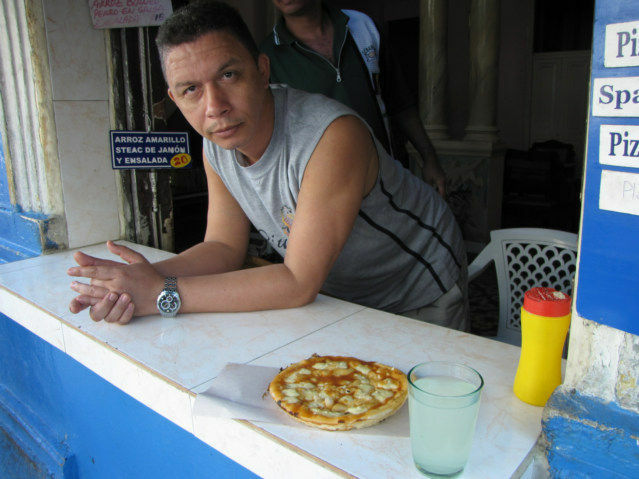 It appears that Pizza has become a staple food in Cuba, at least in Centro Habana where I am presently staying. I asked him to smile, this is as good as it gets. 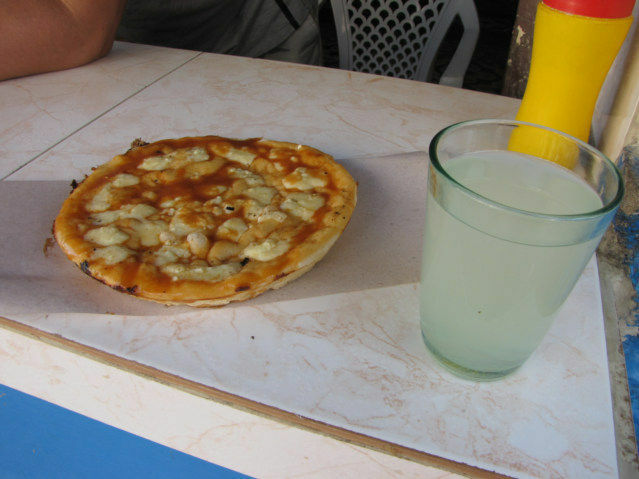 I paid 8 Pesos of the Moneda Nacional for the cheese Pizza, and 1 peso for the lemon drink. This is approximately 35 cents USD. In the cool of the evening, right before sunset, these small shops have people lined up waiting for a slice of Pizza. I had noticed the pies being mass sold in the local bakeries. The price list, it is best to always pay with Moneda National at any local restaurant, even when you are not sure. They will tell you if you need the CUC, it is not really tourist money, it is money that is needed to buy non-essential type things. I feel that social status is extremely important in Cuba, if a person uses CUC or the Convertible Cuban Currency, they are making a social statement, saying I am not poor. While if you use the Moneda National, it says, I am in the lower rungs of society. I have not been able to get locals to explain the reasons whey there are two currencies. I am not sure they know, they just accept it and know how to use them, not trying to figure out why. 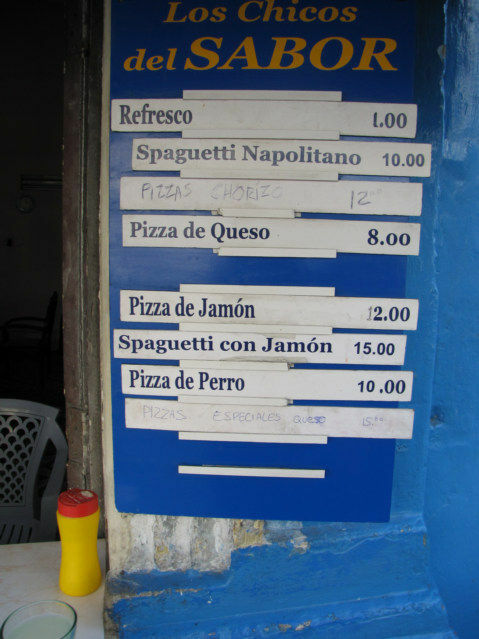 The locals need both currencies, the Cadecas or the Casa de Cambios are everywhere, and this is a huge business in Cuba. They are constantly losing money to the money changers, another indirect tax of Cuba. I have Moneda Nacional in my left pocket, CUC in my right. I know when I spend the money in the left pocket I am understanding the working class, when I pay with CUC, I am learning about the upper social strata. 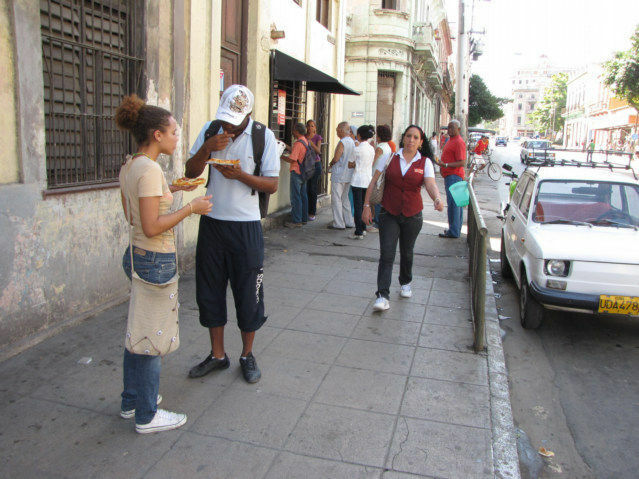 I believe the normal working person in Cuba makes about 5-10 US Dollars per day, and this noise about them making 20-40 CUC per month is just gossip. It would take me months to figure out the truth, there is too much obvious wealth to say they earn 30 dollars per month.